Vetiver Grass is a non-invasive plant used all over the world in a variety of applications. 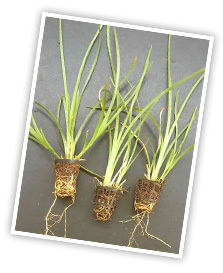 Vetiver Grass has a massive finely structured root system that is unique among grass. The plant’s roots grow straight down as a mass as dense as the amount of lease it produces above the ground. These roots penetrate 10 to 15 feet in the soil before slowly thinning out. New roots and shoots develop from the root crown and continue to grow and fill in at the surface level, with the new ground level eventually forming a terrace behind the hedge. Vetiver Grass can survive conditions under which other plants cannot live. It will tolerate prolonged drought, fire, flood, submergence, and extreme temperatures. In some cases it may be the only plant to survive. Its ability to regrow quickly after being affected by these adverse conditions is unequal by other plants. Because of its previously stated properties, Vetiver Grass is used very effectively in wastelands, disturbed lands, and levee protection. Planted as a hedge, or as a series of hedges, Vetiver stabilizes the erodible ground (particularly steep slopes) and it protects against soil erosion. On levees and bluffs near water, Vetiver will protect the soil from erosion due to wave action, lateral water movement and will protect the land side of the levee from scouring and breaching during as topping from a storm surge. Vetiver grass planted at the interface between soil and concrete such as culverts, bridge structures and moving water, supports and drains, will prevent undermining and loss of structural integrity. This has been tested for years in China. Vetiver grass has been used for pollution control in many counties for years. In Australia, Vetiver is used hydroponically on ponds to remove high levels of phosphate and nitrate. Vetiver has bee used to reclaim soils and increase productivity in places that were previously believed to be totally unproductive. Vetiver is being used to rehabilitate copper mines in China, coal mines in Indonesia, and diamond mines in South Africa.